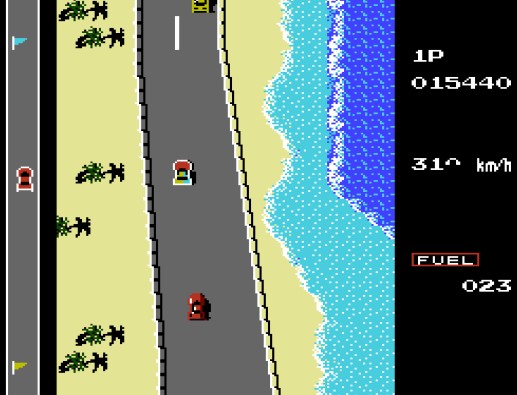 Road Fighter is a driving game that was also released in the Arcades (1984) and MSX computers (1985). It consists of four stages and the goal in each is to reach the checkpoint before your car runs out of fuel. Gas can be topped up by collecting icons scattered across the road, but care must be taken to dodge fellow drivers and hazards such as oil slicks; crashing causes your vehicle to explode and precious fuel is wasted until you're placed back on the track. The stage design is varied, with Stage 3 being the most interesting and challenging course, as it ditches the wide open roads in favour of narrow lanes that are heavily populated with traffic. The smooth scrolling is flicker-free and the controls are tight, allowing you to zigzag around cars with ease. This precision is definitely needed, as the game is blisteringly fast! One great feature is how expert players can escape crashing by bumping into fellow drivers at certain angles; this creates a pinball effect, and if timed correctly, you'll end up staying on the track and saving precious seconds! Slamming on the accelerator and avoiding a wreckage for long stretches is exhilarating, especially when you speed past a checkpoint just before time expires. 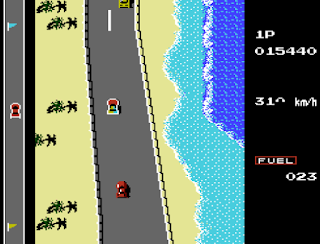 However, while the gameplay is undoubtedly fun, only four of the six stages from the Arcade original are present; even the MSX version had the complete set of stages and this makes an already short NES game lack much in the way of value. On top of this, the between stage transitions are missing, which is a real shame as they displayed your progress and showed the types of locales you could expect up ahead. At least there's two difficulty settings to test your ability, and you'll really need ninja-like reflexes in Level 2! Road Fighter is a solid driving title with top-notch controls, great stage design and addictive gameplay. However, while it's clearly entertaining, it's hard not to consider it a butchered port when compared to the Arcade original (or even the MSX version) due to the missing stages and absent course transitions. Random trivia: The Nintendo Famicom version was released seven years earlier!